This past weekend I had two ex-boyfriends both called "Steve" (name has been changed to protect me from getting beaten up) call me with in ten minutes and both ask me to meet them at the exact same coffee shop to "catch up". "Steve" and I had become friends. My friend Hannah (real name) told me that "Steve" was gay, which was great for me because I was not interested in "Steve". "Steve" invites me to his dorm room to watch Les Diaboliques. I arrive, we start the movie, "Steve" tries to kiss me. 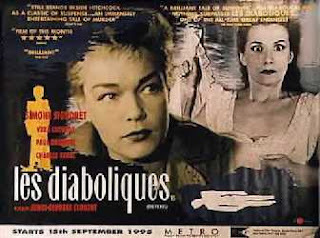 I say, no thanks "Steve", and despite the fact that I should have left right away to avoid more confusion , I stayed and forced "Steve" to actually watch Les Diaboliques, because I really wanted to see it. Needless to say we avoided each other for the next three years. It was a weird weekend. "Steve"- wise. I don't remember this at all. But you know, my gaydar has never been the best. hahah!! I didn't blame you at all. It was a hard call. facebook event? i can't believe i made out with you! This is the best post ever and am upset I didn't get mentioned! I could mention my favorite "steve" of yours but then you'd come here and kill me and take my kittens.